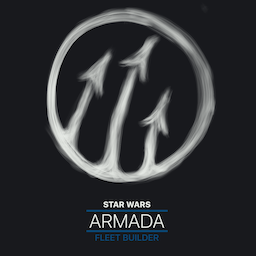 A fleet building application for the Star Wars Armada tabletop game by Fantasy Flight Games! 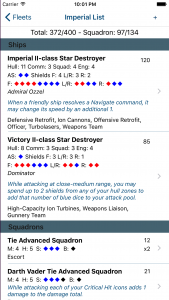 Build your list by adding ships, assigning them upgrades, and adding squadrons and objectives. The app follows standard fleet-building rules and restrictions as you build out your fleet. 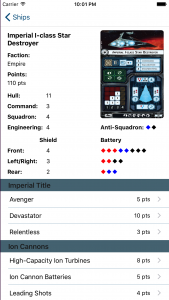 Plus, you’ll have all cards – ships, squadrons, upgrades, and objectives – available for reference in your pocket! Bug Report: I am Making a Fleet with an Assault Frigate Mk II A; I can’t seem to use a title card. There is an option called “Assault Mk II” that is empty, I think this is were the title option should have been. Thanks for letting me know! The latest update should have this fixed! Love the app! Thanks for tackling this. Please add Corellian Campaign objectives and squadrons ASAP … then it will be complete and fully operational. Thanks! And yes Corellian Conflict will be updated in the next couple of days! 2. The ability to copy a fleet to quickly modify an existing fleet. 3. The ability to copy a ship with upgrades within a fleet so if I have a flotilla with comms net built, I can quickly copy it to have a second. 4. Win / loss tracker for each fleet. Just some ideas but I love the app! THANK YOU!!! Thanks Wayne! I’ll figure out where Zertik flew off to and instruct him to return for court marshal. Thanks for the suggestions too! I’m actively working on the collection feature right now. That was part of the reason I wanted an iOS app in the first place! And the other two are definitely on my list of features to add. Fly safe! Hi, not sure if this is the right place, but i’ve found i can’t add a title to the assault frigate mk2 B. The line i assume that is for that says the ship type insteas of title and doesn’t bring up a list when tapped. Great app, especially like the filtering so you have to follow the rules for upgrade. One thing a lot of the web based builder are missing, a filter for what packs you own. E.g i don’t want to see what is in the correlian campaign, because i don’t have it. Might be a good addition. Yes thank you! This was precisely the place to put this! I’ve fixed the issue in the DB so you should see the proper titles the next time you restart the app. And it’s funny you should mention the filtering for what packs you own, because we just pushed an update to Apple for review that contains EXACTLY that feature, so expect that update next week sometime! I love this app! I would love it even more if it had a print or export feature. 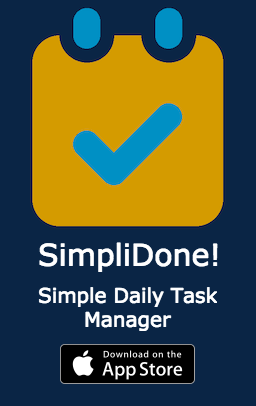 Thanks for making it, it is really handy! Thanks Reece! There a lot of people have been asking for a text export option, so there is a new version on its way with exactly that feature! Bug report: as I scroll down on my larger fleets the app crashes. The last update says it fixed this but it is still happening. My app is up to date and did not start doing this until I downloaded the last patch. Is this app still being developed? I put in a bug report almost 3 days ago and still have not had my post authorized. Also, an earlier comment in October about adding the Corellian conflict was replied to with “it will be added in the next few days”. 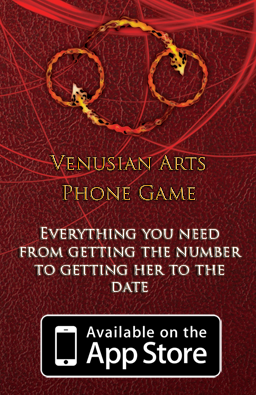 Has this app been abandoned? Hi Heath! Sorry I’ve been away on vacation. Yes the app is most definitely still being developed. I’m looking into fixing the crash for larger fleets. The Corellian Conflict squadrons and objectives should already be added too. Can you please verify that you are using the latest version of the app, and that the database has updated? Confirmed. I am using app version 1.7. Still crashes for larger fleets. I use the app all the time. But in the last few days, it crashes everyone I load a saved fleet. I’ve tried uninstalling and reinstall the app, and I get the same result. I click on a fleet, the app kicks me back to the home screen. Hi all, just letting you know that there is a new version, 1.8 that resolves the crashing issue in the app store now. 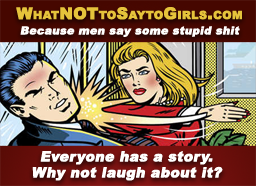 So if you have not updated, please do so and let me know if you run into any further issues! And just an idea when you are browsing your lists and enter a list when you leave it returns you to the top mabey an option when you return out of a list that you resume from you last position? Any chance of an update? Ships have been out for almost a week now. Apple for some reason decided that this was the time to hassle me about having the words “Star Wars” anywhere in the app, so they’ve been screwing me around over all sorts of things and put me in the “extended review” track. 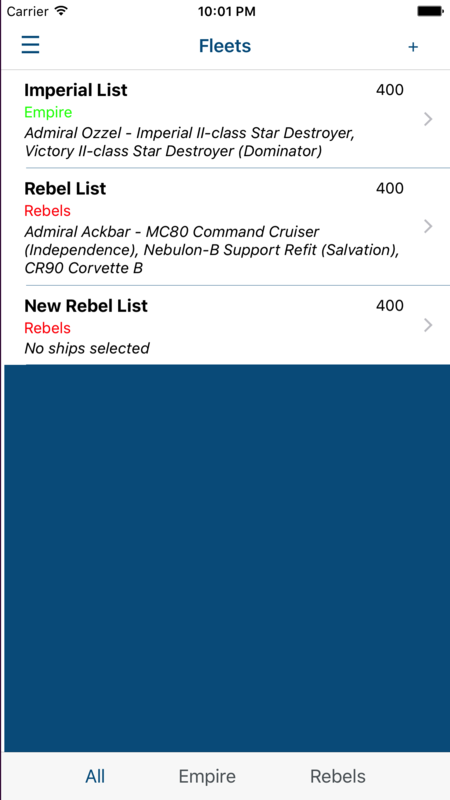 Bug Report: I am using Version 1.10 (IOS) and when adding cards to a fleet list the cards available are all doubled. The app still works, but seeing two of everything makes the interface twice as long to scroll through. This happens for ships, squadrons, and expansions. Limiting the interface to my collection doesn’t change anything. Really like the app, but would love to see this fixed. 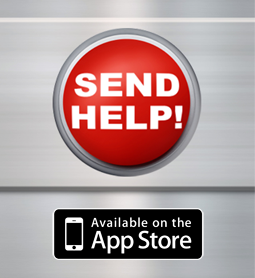 Great app!!!! Really need wave 7 included please. Like yesterday please. Sorry, I see the previous comments above. Thanks for all you do! Since the most recent update, app immediately closes, making it unusable. Hi Scott, I have a new update that should resolve this crash waiting for review from Apple. It should be available in the next few days! Saw the update and installed. Able to get in, however now I’m crashing randomly every few times I update a list. Seems to happen when I add an upgrade, but the upgrades themselves seem random. Happens the most when adding Leading Shots to an MC-75. Will you be making one for sw legion? Yes! 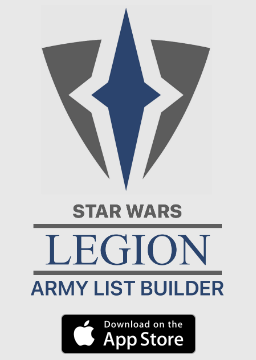 I am definitely planning on making an iOS list builder for Star Wars Legion! 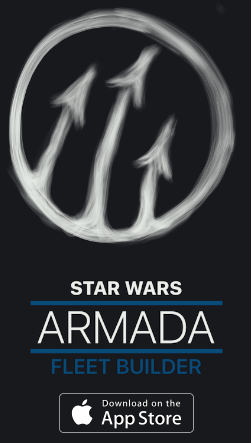 Hi, using the armada app and loving it! Great you created it! Think there is a feature that might have added value, hoping it can be added. When buying separate cards (yes, one can), I cannot add such separate purchases. Could this feature be added, perhaps via the card section? Perhaps a similar approach could be added when buying barebone ships (no cards) or separate fighter groups? I read somewhere the max fighter loadout was 1/3 of the points, rounded up. Is this enforced at the moment, or possible to enforce? Last request is real nerdy. When building a fleet, the app sees everything as ‘available’. I guess there are those, like me, that have enough, deliberaty, to create 2 fleets. Can the app be made to ‘see’ what fleets need to coexist from the same collection, at the same time? Hi Mark! These are some great ideas! For the max fighter loadout, we show the total fighter squadron points at the top of the list, but we don’t force the app to only show you squadrons that can still fit within the limit. An option to toggle that behaviour is definitely in my backlog of features to add though, so I will definitely get to it! 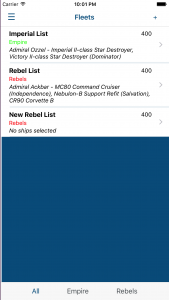 Is there a way to make it so you can build both a Rebel and Imperial fleet in the same list. I ask because I am trying to build versions of both fleets to be used for casual play but I have to remember which cards (that I have limited number of) were assigned to which ship between the teams – I don’t want to use one copy of a card in two or more different places if I don’t have physical multiples. 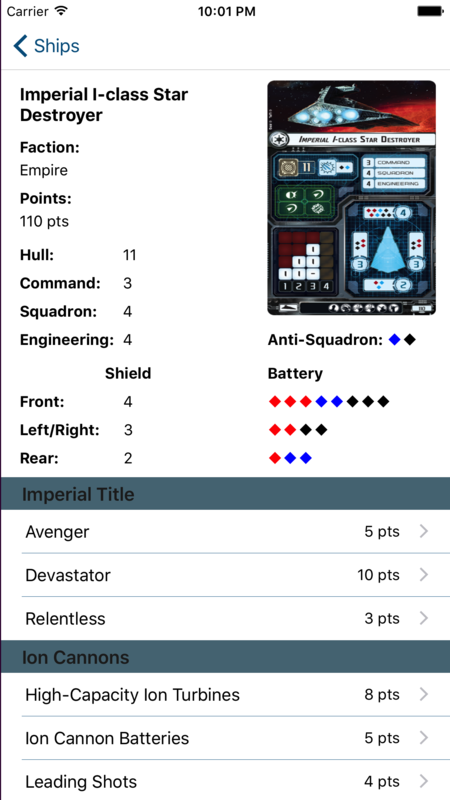 As it is currently, if I am building a imperial fleet – I’ve set in the app what expansions I have so it knows exactly what content I am using. If I have one copy of X card and I assign it to ship A, then I can’t assign it to ship B because it’s already been used. What would be nice is to have the option to use that same function between the rebels and imperial fleets. Maybe if they were linked somehow. Also, having a upgrade card counter would be awesome. As you are assigning upgrade cards, have it show how many of each card are still available (currently unused/unassigned). That way you could decide which ships you wanted to assign the card to based on its scarcity. Anyways, I really love the app. Thank you! 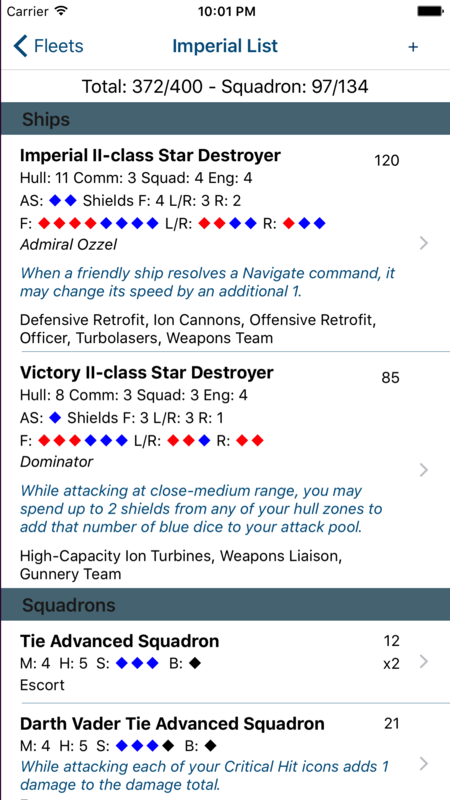 Bug Report: using Armada Fleet Builder and trying to add non-names squadrons and the +/- sign changes to Save and then when you tap the new save button, the app crashes. Thank you. Thanks for the heads up on this. It should be fixed now in the latest update!